Hop on down to Guildhall Square this April as we present a fun family day out that is full of activities with the return of our Spring Easter Family Fun Day! On Wednesday, 11 April from 11am, bring your family and friends for a great day out! We'll be filling the square with some really cool children's rides* and attractions. Look super-awesome and dazzle your friends by having your face painted. Sit back and enjoy some funny cartoons on the Big Screen and why not enjoy some gardening activities for you to take home. Not only that, we'll also be offering a kids Easter hunt, right in the square! 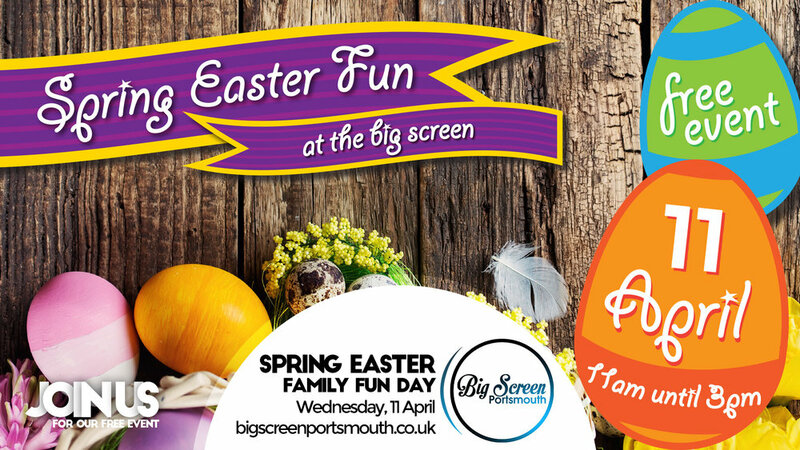 Our Spring Easter Family Fun Day returns, and we can't wait to see you come and join us. Will seating be available at the event? We will provide standard chairs however, you may want to add a bit of extra comfort by bringing your own, which we welcome. There is no programme available for this event. The Isambard Brunel Car Park is the nearest to the Big Screen Portsmouth offering parking for the day. When leaving this car park, exit left towards the Guildhall Bell tower. You'll need to walk up steps by a bridge crossing, this will take you to Guildhall Square. There is a chance that the event may be cancelled should the weather become too adverse. Information will be displayed on the Big Screen to keep you informed as well as hosts and security will be on hand to provide assistance. *Some rides and experiences may incur a small fee. Some activities and experiences mentioned are subject to change. This event is subject to weather conditions and could be cancelled at anytime. This event is presented to you for free by Portsmouth City Council.